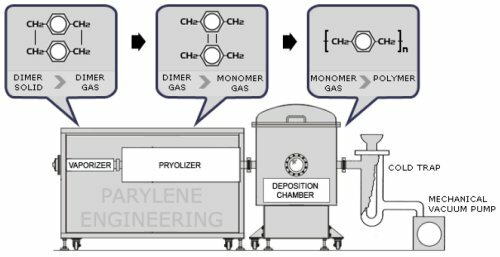 The parylene polymers are deposited from the vapor phase by a process which in some respects resembles vacuum metalizing. Unlike vacuum metalization, however, which is conducted at pressures of 10-5 torr or below, the parylenes are formed at around 0.1 torr. Under these conditions the mean free path of the gas molecules in the deposition chamber is in the order of 0.1 cm. Therefore, unlike vacuum metalizing, the deposition is not line-of-sight and all sides of an object to be encapsulated are uniformly impinged by the gaseous monomer. This is responsible for the truly conformal nature of the coating. The process consists of three distinct steps as shown in Figure 2. In contrast to parylene, the thickness of liquid coatings is related to viscosity, working temperature/humidity, and application process (spray or dip), and can only be controlled to a tolerance of approximately +/- 50% of final thickness.